Images are serving up more often in mobile query results, triggered mostly with local searches. As of July 13, RankRanger estimates a 183% increase, up from 15.7% for those searching Google from a mobile device, that an image thumbnail will appear in query results on the first page. Images increase click-through rates. Images catch the attention of someone searching, especially on a mobile device, so it’s not unusual for more images in results to become the next evolution of search. The real innovation will occur when those static images become six-to-15 second videos. The prior increase of image thumbnails in query results occurred in September 2016, when mobile image thumbnails went from appearing with less than 1% of all mobile pages to more than 10%, Mordy Oberstein, RankRanger content manager, wrote in a blog. The keywords are not tied to geographic regions, like Germany or Italy, or specific locations, like Miller Park in Jackson Hole, Wyoming. Instead, the thumbnail images are tied to queries for searches of a local service or business. These are image thumbnails in organic results, Oberstein wrote. 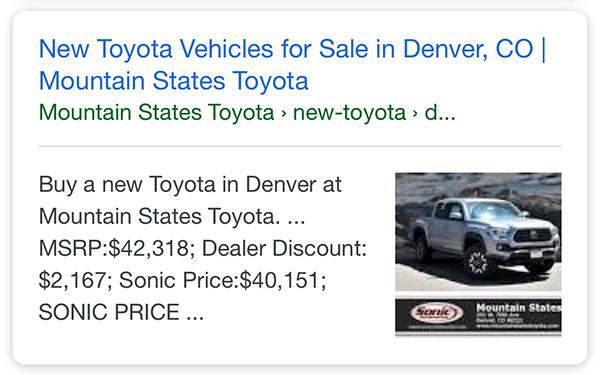 For example, on July 13, the keyword phrase “toyota dealer in denver” did not produce an image thumbnail; recently it did. Oberstein sees the same for non-static products. He searched on “new homes for sale spring tx” and found similar results in Zillow and other sites, like NewHomeSource and Trulia. Near-me searches also bring up image thumbnails in feature posts, highlighting the 10 best civil litigation attorneys in a specific area.